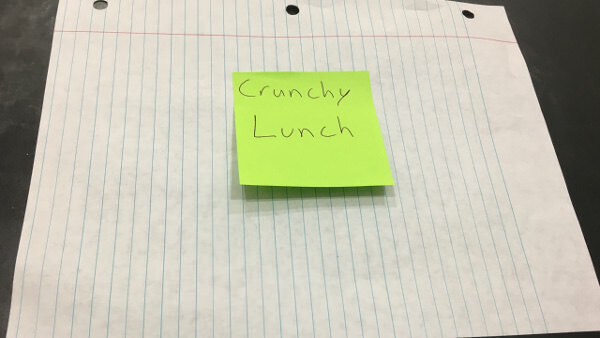 Crunchy Lunch is a comedy VN about when you take your lunch to work and IT'S SO LOUD THAT EVERYONE ELSE IN THE OFFICE HEARS IT!!! Hey, thanks for playing! Handwriting all of those sticky notes was a bit of a pain, but I really enjoyed putting it all together. Congrats to you for your NaNo release too!! This is a great execution of a simple idea. It's concise, has good short-hand humor, and has a kind of 'business' rush feeling to it. I think you smashed your goal and I hope you're proud. Hey, thanks for taking the time to leave a comment here too! It really helps!! I was really excited when I came up with the idea because I knew it'd be a perfect fit for something like NaNo. Glad you enjoyed it! great game! i was wondering where the story could possibly go with that initial premise! HAHAHAHA! I don't even know how it got 'longer' into 'lingerie'. But maybe both is accurate. These are amazing!!! Thanks so much for sharing these! It's really interesting to hear how you were able to use all those sound effects. Yes, in general I'm cool with any sort of remix, adaptation, Let's Play, etc. of my stuff. As long as you're not incorporating my work into, like, cigarette ads or something, you're probably good! lol, sometimes autocorrect really has a mind of its own. Oh goodness, if this ain't the definition of short and sweet. Loved the tone of the writing and the crunchiness in general. Gave me war flashback of the time a classmate and I opened her lunch to see what she brought and flooded our classroom with the smell of chicken... in geography class. Anyways, loved the uniqueness! Looking forward to more of your releases!